I recently met Wayne again after almost 20 years. We used to work together. He was in supported employment and I was the “Speechie” there. Wayne is deaf and was a fluent sign user, mostly relying on fingerspelling. He also used a speech generating communicator called a Lightwriter which was great for people who didn’t fingerspell. He was very social and lots of fun. He had a great sense of humour. Last I heard he was living in the community, travelling independently and still working. I met him recently at a meeting. The first thing he signed to me was that he was married! He was so happy, his grin said it all. His wife Cathy is also profoundly deaf and they live in a nursing home as Cathy uses a wheelchair and needs daily physical support. I had trouble “reading” Wayne’s fingerspelling as he now has crippling arthritis. He no longer had his Lightwriter. Over the years, his communication had gradually reduced to the point where only Cathy could read his signing and communication was very slow. I thought of all the instances during Wayne’s day when he would not be able to interact with people; travelling on the bus, talking to co-workers, buying a pie, celebrating success of his beloved Hawks, chatting over lunch with friends, talking to his sister, socialising at home with nursing staff and housemates. When Cathy wasn’t around he couldn’t communicate. Wayne’s communication access to his world had narrowed right down. He couldn’t talk to people and they couldn’t talk to him. This gradual loss of communication had happened over such a long period that people didn’t think there was anything that could be done. After drawing the alphabet on a piece of paper and having a conversation with Wayne and his sister using this “board”, they agreed that communication was so much quicker and clearer and that it would be useful when he was “out and about”. 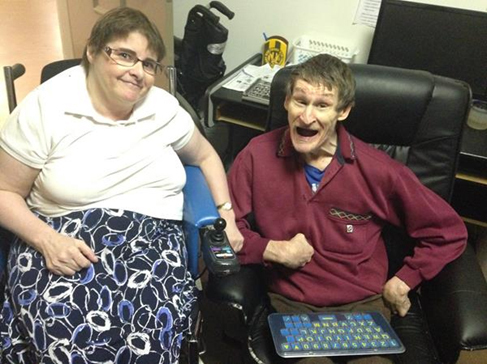 Two weeks later Wayne received a Frenchay Alphabet Board (FAB) from Scope’s Non Electronic Communication Aid Scheme (NECAS). It is just the alphabet on a perspex board but it was like magic for Wayne and Cathy. Wayne is never without it, it lives in the basket of his walker. Cathy says it has made their conversations “wonderful” and that Wayne was so excited to be able to order his own dinner at home instead of Cathy ordering for him. 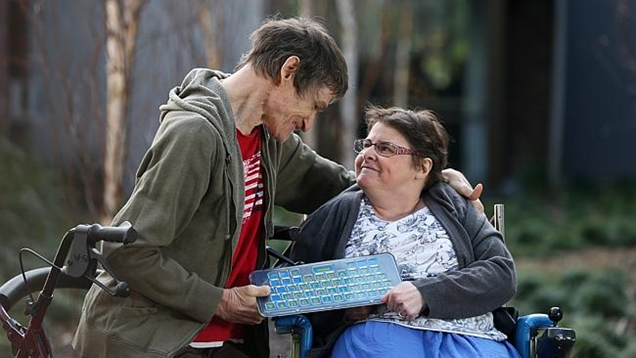 The next step for Wayne is to look at a voice output device again so that he can make his voice heard again in the community. It made me think about how small things can make a big difference and each communication aid or visual display in the community can have a huge impact. Also, the benefits go both ways. Wayne has greater access to his community and Wayne’s community now have access to his lovely personality and he can brighten someone’s day with his great sense of humour. This entry was posted in Uncategorized on November 21, 2014 by crcscope. I am enthusiastic about accessible information. I admit that I get very excited when I encounter accessible information in the community. I usually congratulate the bewildered shop staff and go on to preach the merits of communication accessibility and its place in universal access. To amusement of most, I photograph the example as a keepsake of the wonderful efforts that people have gone to, to increase accessible for everyone in our community. 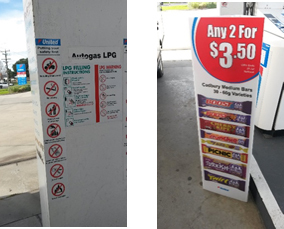 Accessible Information Safety Signage and Advertising at the United Petrol Station, Bairnsdale. I recently flicked through my collection of photographs as I was preparing for a workshop on “Making Written Information Accessible” later this month. I was struck with the number of examples of accessible information from petrol stations and multicultural restaurants. This led me to ponder the motivations of people to produce information in an accessible format and how a better understanding of motivations may enable CAN speech pathologists to increase their efficiency to facilitate organisations to become communication accessible. So why petrol stations? Next time you are at a petrol station, take the time to have a look around. The safety signage (and even the advertisement!) at petrol stations are a brilliant example of the use of symbols to convey information. Perhaps the necessity of prioritising the safety information in the signage has enabled people to present information in accessible format. Or perhaps I am underestimating the motivations of sign’s authors and they instead where aiming to gain the status of communication accessibility. Accessible Information Signage at Dumplings By the Sea in Lakes Entrance. And Dumpling Restaurants? I am sure that you, like I, have marvelled of the communication accessibility of the photo menus of many multicultural restaurants. A small dumpling restaurant in Lakes Entrance has a menu presented in an accessible format to rival any “Easy to Read” DHS document. Each dish is clearly photographed with the price, being perfectly communication accessible. Perhaps the motivation of the menu creator was to communicate a menu of delightful cuisine for which English words do not suffice, or perhaps it was to create an environment of communication accessibility. Within my role as a speech pathologist in the Communication Access Network (CAN) I continuously spruik the value and need of accessible information. My motivation is to increase the participation within our community of people with communication disabilities. This is the core business of my role and is dictated by funding bodies. This motivation is of course perfectly valid and merit worth, however it may be more correct to think of in terms of universal access. Not in terms of “communication disability” but for participation for all of our community. Perhaps an occupational hazard of working within the disability sector is that one can become disability focused. Universal access, of which information accessibility is a part, is not focused on minority groups within our society, it is focused on the whole of community and the commonality of humanity. To think in terms of universal access and focus on the commonality of needs, may enable our goals of participation to be more likely to be achieved. After all, I think that like me, most people could identify with one or more minority groups with our society, but we all share in our humanity. So my point is to remember the commonality of needs within our communities and aim to highlight this commonality when facilitating community projects. Perhaps the safety signage at petrol stations and the photo menus at dumpling restaurants can remind us of our commonality in humanity. This entry was posted in Uncategorized on November 11, 2014 by crcscope.